Dear Students, the first day of IBPS PO Prelims Exam 2018 is over already. The preliminary level exam for the recruitment process of Probationary Officers in the Public Sector Banks of India was conducted in four shifts today. As per the schedule of the IBPS PO Exam, this examination will be conducted tomorrow as well. All the candidates who have their examination scheduled for tomorrow would be wondering if what could be asked in the shifts of IBPS PO Prelims Exam that are yet to come. So here are the key takeaways from today's IBPS PO Prelims Exam to help you get a peek into today's examination pattern and an idea of what could be asked in the upcoming shifts of this exam. The difficulty level of today's IBPS PO Prelims Examination lied somewhere between easy to moderate with a varying difficulty level across the different shifts. 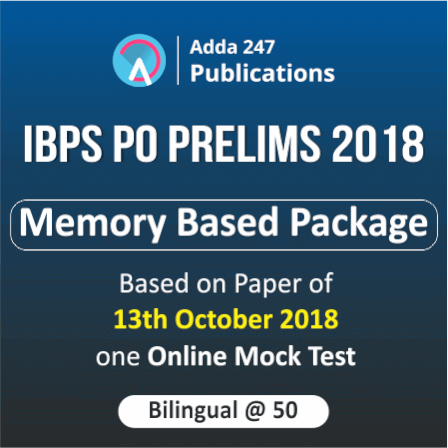 No new pattern questions were observed in today's IBPS PO Prelims Exam as most of the questions asked in this examination were based on the usual old pattern (especially based on SBI PO Pre 2018 pattern) that is being followed by various banking examinations being conducted this year. Talking about the English Section of IBPS PO Prelims Exam, it can be conjectured from today's IBPS PO Pre Exam that level of this section may be Moderate in tomorrow's shifts. The expected topics are Cloze Test, Fillers, Matching to get to a complete sentence, Phrase Replacement, Error Based Questions, Word Usage, Reading Comprehension and Para Jumbles. It was observed that a completely different set of questions was being asked in the different shifts so be ready for an all-new pattern/ set of questions in this section. Moving forward to Reasoning Section, it can be observed from today's shifts of the IBPS PO Pre Exam that the difficulty level may lie somewhere between easy to moderate. 8-10 questions could be asked on the miscellaneous topics like Direction Sense, Inequality, Alphabetical Series and Blood Relation. 5 questions may be asked on Coding Decoding based on the old pattern. Rest of the questions might be based on Puzzles with an easy-moderate difficulty level. Lastly, as per the analysis of the Quantitative Aptitude Section asked in the four shifts of today's IBPS PO Prelims Exam, one can expect the difficulty level of this section to be Moderate. 11-17 questions may be based on data Interpretation with a moderate difficulty level. Questions based on Number Series and Quadratic Equations were asked in all the four shifts so do not give a cold shoulder to this part of the section. Rest of 7-12 can be expected on the Arithmetic portion (moderate difficulty level). So students, in a nutshell, one can score fairly well in this exam if she goes through the memory based paper of SBI PO Prelims Exam 2018 and IBPS PO Prelims Exam (13th Oct 2018) and gets down to the nitty-gritty. Revise everything you are done with and keep yourself unladen so as to be on the ball at tomorrow's IBPS PO Pre Exam. All the very best!! All the best for tomorrow's shift ! !